NEW RICHMOND, Ohio – Kyle Plush used to love racing a cardboard boat with his best friend, Matt Wabler, in the New Richmond Cardboard Boat Regatta. The fun and sometimes zany race on the Ohio River - its website calls it "corrugated chaos" - went on without Kyle on Saturday, but he was there in spirit. Wabler and Kyle’s family made sure to cherish the day in his memory. "Today is about having fun with families, smiling, laughter,” said Kyle’s mother, Lisa Plush. “It's something Kyle enjoyed doing, so we're doing it in his honor." Before the 16-year-old’s tragic death in April launched investigations and sweeping changes at Cincinnati's 911 center, the cardboard boat race was a tradition for the Plush family. Kyle would design the boat and race with Wabler amid so many floating cardboard toilets, tea cups and other boats more sinkable than seaworthy. "Boat was great. It went really well,” Wabler said. “The guys at the Cardboard Boat Museum were nice enough to prepare a boat for us. We repainted it and did the decorations and stuff. It goes real fast." Wabler said he raced with Kyle the past two years. "I built two boats with him in the past two years. We never won, but it was always a lot of fun," Wabler said. 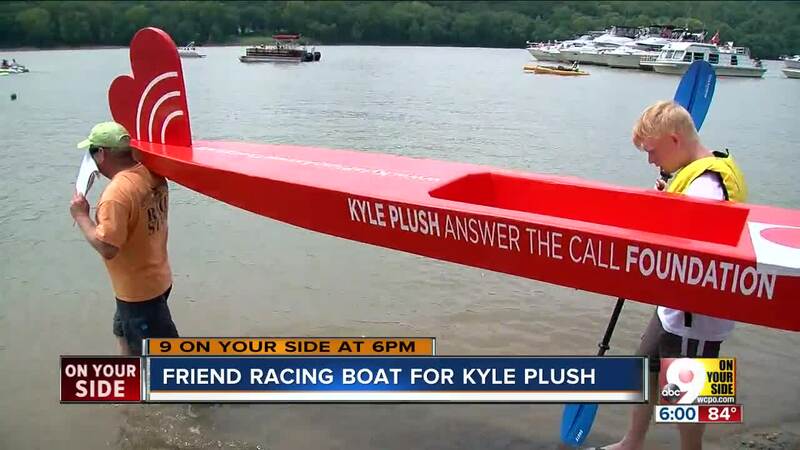 The words on this year’s boat were there to spread the Plush family message, which has been their focus since Kyle’s death. Plush died after he was trapped inside a minivan and his two 911 calls did not bring rescuers to find and save him. Now his family’s focus is on a foundation his parents started in his honor. Kyle’s mother, Jill Plush, said the purpose of the Kyle Plush Answer the Call Foundation is "to uplift communities, and make things safer." They're pushing for common sense public policy that fosters friendlier, more resilient communities. At the Plush family's urging, the city launched SMART 911 which makes it easier for first responders to find callers needing help. There is new leadership at the city's 911 center and plans to add jobs and improve training. At the end of race day, however, the Plush family was all about celebrating Kyle. "He loved coming out here,” said Kyle's father, Ron Plush. “Loved coming out here. Loved designing things. He loved being able to create the boat and then come out here and be competitive." "It's a great opportunity. It’s what he would have wanted, Wabler said. LEARN more about the Kyle Plush Answer The Call Foundation.